Note: Below my review of A Parents’ and Teachers’ Guide to Bilingualism is an interview with the author. Dr. Baker generously agreed to an email exchange, and responded to my questions in detail. Because the book itself has been designed in a question-and-answer format, the interview offers a good glimpse of the spirit and value of Dr. Baker’s work. In What’s the Best Book About Raising Children?, I make the point that every thoughtfully-written book on bilingualism is well worth a look because, chances are, you’ll come away with at least a few additional insights, ideas, or resources that could benefit your personal journey. That said, it’s also true that we’ll naturally find some books richer than others. 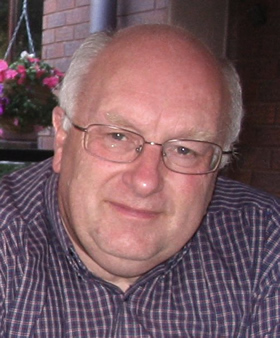 I’ve recommended a number of books on bilingualism at this blog—each one rich in its own way—but the fourth edition of A Parents’ and Teachers’ Guide to Bilingualism, by Colin Baker, is the richest resource I’ve come across to date. It’s important, though, that I draw a distinction between this book and others, because A Parents’ and Teachers’ Guide to Bilingualism is a different kind of resource and a comparison only goes so far. While many books on the subject are intended as primers, with basic information that flows from beginning to end—and for this purpose they serve a valuable function—Dr. Baker, among the most respected authorities in the field, has created a virtual encyclopedia of knowledge based on decades of experience as an educator, researcher, author, and parent. First published in 1995, and revised substantially over the years to stay in step with changing times and current research, the book provides a marvelous wealth of information in an accessible question-and-answer format. In the latest edition, Dr. Baker addresses a great range of key questions—144 in all, each at some length—under such sections as “Family Questions,” “Language Development Questions,” “Questions About Problems,” “Reading and Writing Questions,” and “Education Questions.” Additionally, the book includes an excellent and extensive glossary of terms related to bilingualism. At the same time, I should note that the very richness of this resource, and its sectional design, could make it more challenging to read for those expecting a less-intensive primer meant to be consumed from cover to cover. As such, it would be better to view Dr. Baker’s book as a reference—the foremost reference guide on bilingualism available today—which can be consulted, at any page, whenever a certain interest or need arises. This isn’t to say that it can’t also be read, and enjoyed, from beginning to end, but the nature of the book, and the breadth of material, may make a straightforward reading rather daunting for some. 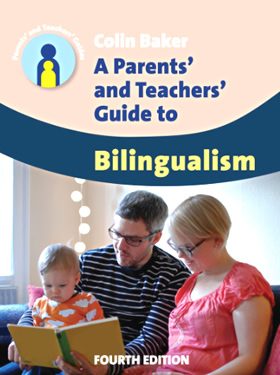 A Parents’ and Teachers’ Guide to Bilingualism is a standout in the field: a comprehensive and authoritative resource that can serve as a core reference for homes and schools. With a book this rich in information, every parent and teacher involved in working with bilingual children would no doubt find value—significant value, I suspect—in Colin Baker’s wise, warm perspective. Dr. Baker, in your book, you discuss the idea that a child’s bilingual development actually begins before birth, in the fetal stage. Could you elaborate? And are there any strategies expecting parents might consciously pursue (without going overboard) to nurture this process? Infants show discrimination between their two languages very early. Memory for language sounds begins to operate in the fetal stage, such that the processes of bilingual acquisition appear to start before birth. Research using a child’s physiological responses to language (e.g. from the mother) have located this. Upon birth, newborns immediately prefer their mother’s voice to that of any other mother, but not if the mother’s recorded voice is played backwards. This is evidence that intonation in the fetal stage is being recorded by the baby. Also, newborns respond more to prose passages read to them regularly before birth than to new prose, even when not read by the mother. Thus an infant is not just recognizing the mother’s voice but the pattern of the voice—which has implications for bilingual input. This pattern can be extended from monolingualism to bilingualism as newborns distinguish their parents’ native language sounds from unfamiliar foreign language sounds. Also, a little later, bilingual infants at 4-5 months old respond differently to their two languages compared with a language they had not heard before. That is, early bilinguals can distinguish between languages they have heard, prenatally and since birth, compared with a new, unheard language. In the babbling stage, babies (around 10-12 months of age) exposed to two languages at the fetal stage and from birth (a) have a tendency to babble in their stronger language, (b) demonstrate language-specific babbling features of each language, but (c) may not babble with context-specific accuracy. What does this mean for parents? It certainly does not mean that parents who do not speak to their children, monolingually or bilingually, in the fetal stage, will have children retarded in language! In terms of language development, experiences after birth rather than the fetal stage will have a much stronger effect. What it does mean is that parents need to be aware that before birth language is being experienced in the womb, and that bilingual input appears to be recorded. Thus, a conversation between, for example a mother and the baby in the womb, positively affects that baby, and is not just for the pleasure of the mother. You also point out the difficulties that can arise when the minority language is considered “low status” and lacks prestige in the child’s eyes. Could you expand on this issue and suggest ways to help overcome the problem? Children as young as four and five come to recognise how others view the two or more languages that are spoken inside and outside the family. Young children quickly understand that two languages are differently valued, sometimes within the family, but also in wider society. Thus a child whose dominant language is the minority language may come to recognise that it is more prestigious to speak the majority language e.g. in the playground. This is transmitted not just by other children, adults and the local community but also by television, the language used on electronic media, and the language used in leisure activities such as sports and other cultural events. attempting to explain to the child the importance of the minority language to the nuclear and extended family, to the community however defined, and to that child’s future in school and employment. To balance any negative comments about the minority language the child hears (for example in school, on the media or with friends), parents often have to sell the advantages and benefits of bilingualism to the child: wider communication, bicultural, in thinking, and not least in future employment. I think many parents, feeling some frustration over their children’s bilingual development, would be heartened to hear your positive point of view on situations where the second language is not as well developed as originally hoped. Could you please share your perspective with parents who are experiencing this scenario? This is one of the changes in advice that academics have given to parents over the last few decades. The early advice tended to assume that children become competently bilingual fairly easily, and that some kind of proficiency balance would exist between languages. This was the evidence from early case studies of the development of bilingual children that were published in books and articles and became quite famous. Also, those writing books and articles possibly had children for whom bilingualism developed easily and strongly. When talking to parents in many “Parent Classes” over the years, I learnt that many, if not most parents do not have a simple or trouble-free time raising bilingual children. Much more typical was one language becoming stronger than the other, children sometimes preferring themselves to speak one language and not the other (e.g. as teenagers), and the child being more comfortable in speaking one language rather than the other not only in terms of competence but sometimes also in terms of status and prestige of the languages. As a bottom line, even if the child goes through a shorter or longer term rejection of one language, then the parent inputting in that language continues the experience for the child and means some language growth even at passive level. Even if the teenager rejects the minority language, the parent can still continue to talk to the child in that language so long as it is achieved in a loving, respectful and tolerant manner. In almost all bilinguals, languages change over the lifetime. Not only during childhood and the teenage years, each language may change in terms of its proficiency and preference. Which language we use with whom, when and where, can change over time. This is the experience of so many bilinguals. Therefore it pays to help the child become as strong in their less preferred language as is pragmatically possible as it provides the potential for the future. To stop using the minority language with the child or teenager lessens the chance of that language being available and used in the future. Also, the idea of a person of any age having two equal, well-balanced languages is more of a myth than reality. Almost all bilinguals have one stronger and one weaker language, although this can vary across different contexts. So there is some normality in the second language not being as strong, suggesting the value of supporting that language as much as possible to provide growth and potentiality. In several places in your book, you touch on the idea—which I believe in strongly myself—that bilinguals and multilinguals expand not only their language capability, but also their capacity for open-mindedness and empathy toward others. In this light, could bilingualism even be seen as a way to promote greater peace in the world? What are your thoughts? First, I need to be honest and say that there is almost no research on this, although it is something that is frequently talked about. Second, I don’t think this is just about bilingualism. For example, I’ve met people who can speak two languages very competently but tend to be monocultural in their viewpoints. Thus, if there is an advantage for bilinguals in being more open-minded and empathic, I suspect it is owned by those who are not only bilingual but also appreciate, even celebrate, owning and operating in two or more cultures. In some forms of bilingual education, children not only become bilingual but also can understand and enjoy both the cultures that are held by, and surround both languages. An example is children in some of the International Schools who are multilingual and much appreciate different cultures. They seem to have more understanding of the value of difference among nationalities, more sympathetic to variety among people, and more tolerant of diversity. We need this to be researched so that these hypotheses can be tested. Looking into the farther future, do you think that the phenomenon of bilingualism will continue to grow and become a more powerful influence on politics and society? How do you see the longer-term evolution of bilingualism in the world at large? When I first started researching and writing in the 1970s, bilingualism did not have the status, the understanding or the positive associations that it has in this decade. In just a few decades, there is a much wider understanding amongst many sections of the public that bilingualism has positive rather than negative effects, that there is more than enough room in the brain for two, three or more languages, that bilingual or multilingual education results in marginally higher achievement levels, and that employment increasingly demands bilingual and multilingual people. Bilingualism was once associated with a small number of diplomats and elite bilinguals. In the rapid increase in internationalism, globalism, world trade, multinational companies and the explosion of shared information, bilingualism and multilingualism has become more relevant, better understood and much more valued. While there are also negative scenarios such as the languages spoken by recent immigrants, the desire in countries such as the United States for the assimilation of immigrants which includes losing their heritage language and operating in English only, and that between 50% and 90% of the world’s minority languages are threatened with extinction, nevertheless the beauty of bilingualism at an individual, family, community and international level is becoming better understood. While predicting the future of politics, religion, and not least languages is very difficult, for the moment, bilingualism and multilingualism is on an upward trajectory, with gains at an individual and societal level increasingly celebrated. First, some sad news… I’m afraid my son’s little seven-legged crab, “Lucky 7,” died before the drawing and so was unable to help choose the winner, as I had described below. However, Roy put on a brave face and stepped in as a substitute: after I scattered the entry slips out on the floor, he pretended he was “Lucky 7.” He got down and scuttled about, crab-like, eyes closed, and finally scooped up one of the slips in his “claw.” And the winner this time is…Peter in France! Congratulations, Peter! And thanks to all those who entered the giveaway and shared your joys about raising bilingual kids. I really enjoyed reading your comments! I won’t respond to your comments here, but I do look forward to reading them. Thank you for entering the giveaway, and for sharing this information about Dr. Baker’s book with others. 4. I love that my son can translate for my parents when they come to Germany to visit us and want for example to order something on a restaurant. 4. I love that my daughter can talk with other people every time we travel abroad! Excellent interview, Adam! My copy is on its way from Book Depository. 4. I really love that we can share with our child not only our languages but also our cultures. Thank you for interesting interview!! 4. My son has developed a kind of his own language (we support him with a special therapy for that), however he perfectly understands and reacts to all of the above 3 languages. He usually makes us extremely happy when, while playing together, he tries to repeat and “translate” the words into the other language. 4. I love that my children feel at home in both Scotland (where their Dad comes from) and Germany. They navigate both countries with ease and don’t feel a language barrier as such, which gives them a chance to explore both places just that bit more freely. 4. I love that a phrase we have generally banned in the house (‘shut up’ in Hebrew) gives me great delight when they use it in English! 4) I love that my kids can communicate with both sets of grandparents in their respective languages! 4. It’s really funny when we are at the playground or something and there is another Japanese family there, and my daughter whispers in my ear ‘They’re speaking Japanese!’ like it is a secret club or something. And my son’s language is currently really taking off – soooo cute to hear him chatting in his high pitched voice to my Japanese husband (his sentences are getting longer and longer these days). And the ability they both have just to switch languages when talking to either one of us is amazing. 4. I absolutely love that when we go to Spain, they just fit in as they have always lived there. I love the fact that while traveling our son can already understand and talk to the people we meet. Love to understand and speak with anyone around the world, and everywhere have our “secret” language, just for us. 4) I think it’s great that my daughter understands, knows and responds to fairy tales, stories, legends and songs in both languages/from both cultures. I can’t wait for her to start creating her own stories and songs to see what she comes up with! 4) Seeing the worldly perspectives and confidence in communication skills that my two boys have makes the daily struggle towards bilingualism well worth it! 4) I can’t wait for the day when my little Eliza will be able to not only understand other cultures but also speak and put her views across in different languages. That day she will officially become a citizen of the world like mummy. There are so many beautiful cultural anecdotes as well as rich literatures that I just cannot wait to take her to this journey where story books teach you about the principles of life and the beauty of nature surrounding us. 4. I love that our house seems much more interesting and joyful since we started speaking all this languages to our son! And even if he doesn’t speak yet, my husband’s Spanish is getting better everyday! Can’t wait to hear our little one’s first words!! 4. I love the fact that after 10 days in France visiting my family my son finally calls me Maman instead of Mamma. 4. She’s not yet bilingual but I’d like she becomes a “citizen of the world” and without English is almost impossible! So I’m working on!!! 4. Seeing my boy understand what we say in English and Spanish is so rewarding at this stage! I can’t wait to hear him talk and see what words he uses! My name is Malu and my babies are 2 & 4. Our languages are English and Spanish and one of my joys of teaching them two languages is watching my kids eyes light up when they make the connection between words in both languages. Such joy! Recently, the 5 yr old took turns listening to all the various languages available during an audio tour we took on a train – fun! 4. I love playing a word game with my daughter where we say words in the three different languages. The other day, she pointed to a plum and asked her father what it is in English. So he said it’s a plum. She responded ‘That’s right, papa. Good.’ I love how she enjoys having fun with languages and is interested in the languages other people speak. Love the fact that he has no hang-ups in either language. Just hung out with 16 of his cousins in the U.S. like one of the gang. Baby expected any time now! 4. I love the improvement she makes everyday, little by little, word by word. This joy answers to my question “why am I doing all this?”. I am sure she will better understand the world. 4. That my son was able to say “happy birthday” for the first time to his great grandma! 4. My daughter says ‘I love you, Mummy’ in more than one language and I love it! Next post: Another Fun Quiz on Bilingualism! Test Your Knowledge!